← Sam Sifton is Right – Make This Chicken and Shallots Dish! Everyone once in a while I do try to make a meatless dish so we can stay away from red meat. We don’t eat a lot of it here, but every little bit helps some, right? It’s also no secret that I watch a lot of Food Network, especially when it isn’t baseball season, so a few weeks ago Michelle and I saw Diners. Drive-Ins and Dives and Guy Fieri was a restaurant in Queens where they made this really great looking vegetable burger. 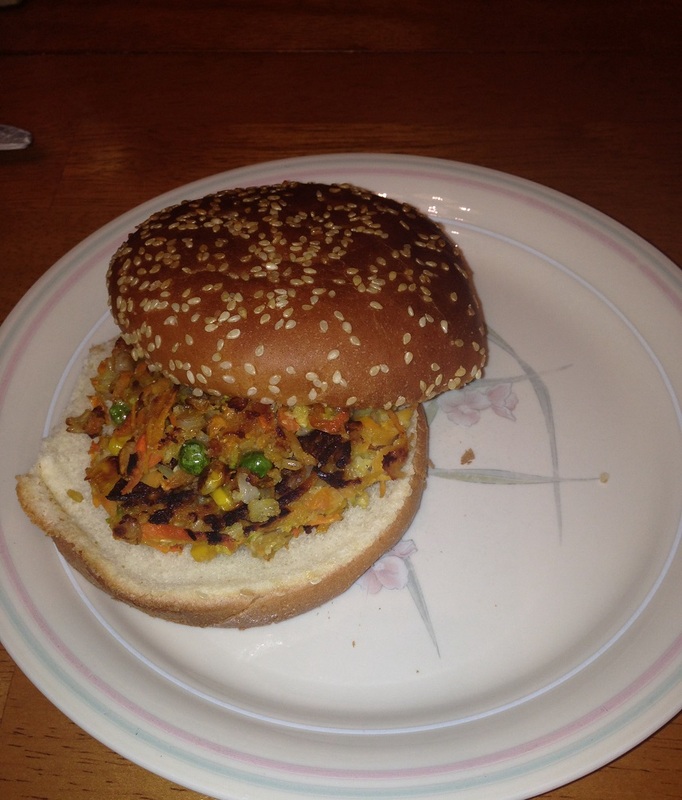 Now most vegetable burgers I have had in the past have left a lot to be desired but this one looked like it had some great stuff in it so I wanted to give it a try. It took me a while to track down a recipe online and even then it was not very specific so it took a little manipulation on my part to make this one work. Mix the carrots, zucchini, cooked barley, corn, green peas, sweet potato, scallions, breadcrumbs, red pepper, mushrooms and the cooked brown rice together in a large bowl until blended. Allow the mixture to sit for 1 hour so the flavors can meld together. While the vegetables sit, make the sweet cayenne mustard sauce. Mix the yogurt or mayonnaise, the cayenne pepper, mustard and the agave or maple syrup together in a medium bowl with a whisk until smooth and well blended. Set the sauce aside. Pre-heat the oven to 325 degrees.For the veggie burgers, measure out six-ounce portions – about the size of the palm of your hand – and form patties for the burgers. Place the patties on a lightly oiled baking sheet. Cook the patties in the oven until they are cooked through, about 45 minutes. Remove the baking sheet from the oven. Heat a large skillet over medium-high heat and add 1 tablespoon of vegetable and heat until the oil is shimmering. Add the patties to the skillet and cook until the burgers are browned and crunchy on the outside, about 4 minutes per side. Drizzle the sweet cayenne pepper sauce inside a pita. Add the lettuce or bean sprouts to the pita, then add the veggie burger and the pickles and drizzle with more sauce if desired. Repeat with the remaining burgers. Okay, here are a couple of things we noticed in this recipe. First, this recipe makes a lot more than the 6 portions the recipe purports to make. We had over twelve patties when all was said and done, so you can bake them and freeze them so you always have some ready to make when you feel like having one and just defrost it and bake it in the skillet. Second, these burgers do not hold together well because there is not much to bind them. We actually experimented with another batch and added 1 beaten egg to the mix and they held together much better than the first batch. From what I have been able to see about the Sparrow Diner, while they call it a burger, it is not really served as a burger that holds together, which is why they serve it in a pita, which is fine, but we wanted more of a burger texture so we added the egg and served it on a hamburger roll. Finally, for the sauce, I cut back on the cayenne pepper. Three tablespoons is a lot of cayenne pepper, so if you like it hot, go for it, but if you want something milder, cut back a bit and you will have a great sauce. Michelle and I both liked the results of the burger. It had great flavor with all of the vegetables and we enjoyed. In the interest of full disclosure, Sean hated it. He didn’t like the taste and said it didn’t hold together well, but I think for the majority of teenage boys who hear they are having burgers for dinner it was an understandable reaction. He did eat it, but he wasn’t happy with it, so next time around I guess it is just for me and Michelle. That’s all I have for today. Check back next time for another recipe. I’ve been really busy lately so I haven’t been able to blog as much as I want, but I am going to try harder to keep up regularly since I still have lots to share. Until next time, enjoy the rest of your day and enjoy your meal! On the food network TV program, the cook used mashed potatoes and not sweet potatoes. The cook also added one beaten egg as you suggested. I would adjust the recipe according to this. Will let you know how it turns out. Susan – I had seen the recipe on the show as well but didn’t catch all of the ingredients and then tracked it down on the Internet to try it out, using that recipe. I am curious as to how it came out for you with the mashed potatoes. Thanks for the comment!